A Russian-American joint venture finds success in focusing on details and hiring the right people. The joint venture of the American company Hamilton Sundstrand and Russia’s scientific production association, Nauka, began operations in Moscow in 1995. Since then, the company has earned its enviable standing in the global marketplace through technological innovation, state-of-the-art equipment and painstaking introduction of the most up-to-date organizational and management strategies. During the past 17 years, products manufactured by the joint venture have found their way to leading international and Russian aircraft companies. Its list of customers includes such names as the Boeing (U.S.), Tupolev and Ilyushin (Russia), Bombardier (Canada), Embraer (Brazil) and Saab (Sweden). The company invests in its workforce as part of its broader strategy to keep production costs low. Of the 60 employees currently working in the Kimry site, 44 are production workers. This follows the organizational pattern of the company’s Moscow headquarters, where support staff is in the minority. Another important factor is the division of labor. While designers, engineers and technicians are concentrated in Moscow for assembling and tuning of the end products, the company’s facility in Kimry specializes in manufacturing details. Purchasing policies are another vital component to maintaining the company’s competitive edge. “Unfortunately, major Russian aluminum conglomerates don’t produce high-quality metals required for making our high precision details. So we have to import aluminum band as well as most of our technological equipment,” said Mazin. 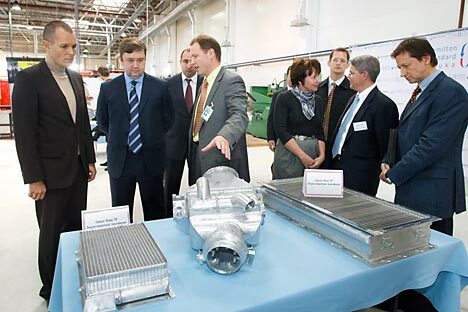 “It so happened that our joint venture became a single Russian buyer of certain aluminum alloys, fin-forming, welding and de-greasing equipment made not only in the U.S., but in other industrial countries.” Purchases of expensive up-to-date equipment are a substantial addition to overall production costs, but having doubled its annual sales in the last five years, HS-Nauka can afford to amortize the investment in up-to-date equipment.